This exhibition at The Common Guild presents Carol Bove’s work for the first time in Britain. With an adept and highly poetic consideration of the gallery space, the show displays a variety of found objects, from driftwood, peacock feathers and seashells to what appears to be fishing net hung almost as a room divider. 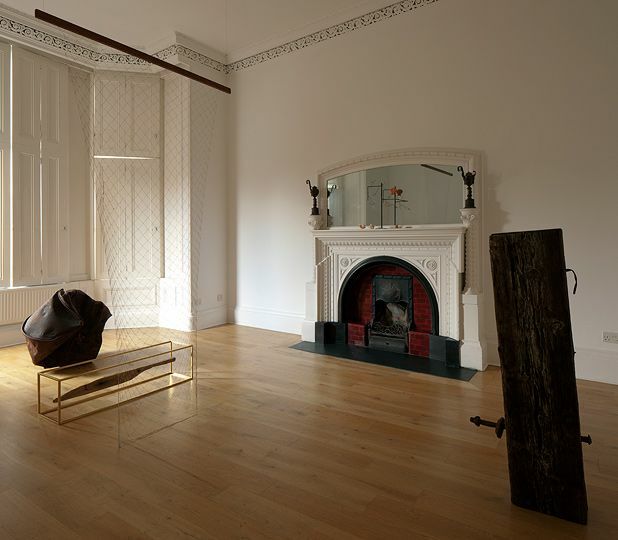 The quality of display is of such high standard, with polished brass frames and pristine plinths, that it feels alien and enigmatic, resonating beautifully with the immaculate whitewashed walls of this tenement townhouse turned gallery space. Such is the integration of the art works and the space, that you find yourself gazing around at the fireplace or window fixtures with renewed vigour; this encapsulates The Foamy Saliva of a Horse which plays with commonly held associations of value and beauty. A steel beam suspends a great lump of eroded and weather-marked polystyrene which, from a distance, appears as a boulder of marble or another precious stone, right in the heart of the eerily white spiral staircase. In all, Bove achieves a remarkably concise, erudite and illuminating exhibition which is well worth a visit. The Common Guild, Glasgow, until Sat 29 Jun. Rearrangement of the Geneva-born artist's installation, originally presented at the Venice Biennale in 2011. A collection of found or handmade objects are presented in such a way as to call to mind the artifice of cultural value and meaning.